When you are dealing with such a complex and function rich software like SOLIDWORKS, it’s easy for a few hidden features to slip through the cracks. Although some of these offer only minor help to your day-to-day design work, some of them can have a major impact both now and in the future. One of these hidden gems many overlook is called the Enhancement Request. Maybe you have created your own hotkey that takes a 10-step process down to one and you wanted to share it with the world? How about some strange functionality that you have crafted up that could be useful to the SOLIDWORKS design community? 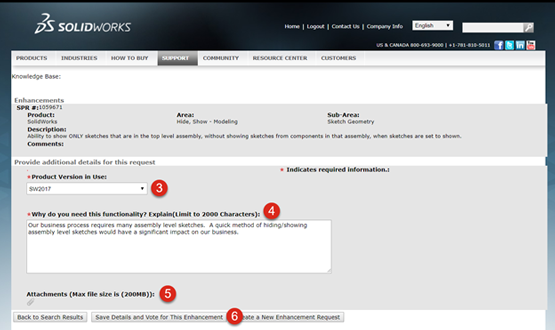 Whatever the case may be, you can use the enhancement request process to increase its visibility in the community, sometimes even to the point that it is added as an actual feature to a future version of SOLIDWORKS! An enhancement request (ER) is an opportunity for our SOLIDWORKS creatives that are on subscription services to submit their ideas, tips and suggestions to improve future versions of the SOLIDWORKS software. These requests are then voted on by the SOLIDWORKS community. By voting for ERs that affect you, SOLIDWORKS gets a better understanding to identify what requests provide the most value to the most customers. This is why it is important to vote for enhancement requests that affect you! Take a look at this video for more Enhancement Insights. The top enhancements of every major version can be found in SOLIDWORKS’ What’s New documentation. Here is the link for the Top Enhancements of 2018! CLICK HERE to log into the Customer Portal. 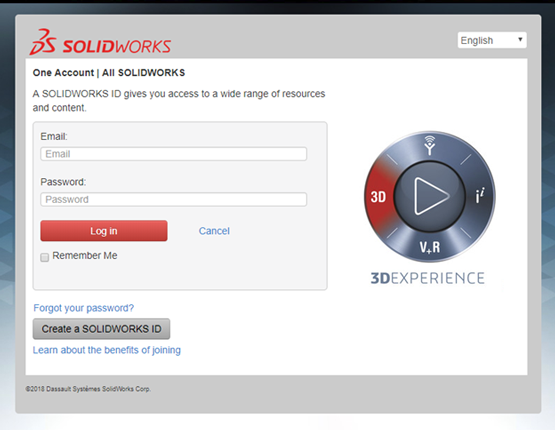 If you have yet to create a customer portal account, click Create a SOLIDWORKS ID. Reference our guide Alignex’ Guide to Removing Padlocks in the SOLIDWORKS Customer Portal for more information on this process. Access to My.SOLIDWORKS.com and much, much more! Once you have logged into the Customer portal, within the “My Support” section, you will find Enhancement Requests. Select this. Step 1: Search for keywords of your suggestion to find similar requests. If a similar request has already been created, it is more beneficial to vote for it than to create a new request. The more votes one ER gets, the higher its priority for implementation in a future version of SOLIDWORKS. Click here for SOLIDWORKS’ tips on searching the Knowledge Base. Step 2: We have found that other users are looking for the same enhancement! Select the SPR number. Step 3: Provide your SOLIDWORKS version using the Product Version in Use dropdown. Step 4: Briefly describe Why do you need this functionality. Step 5: If necessary, use the paperclip to attach a file supporting this request. Step 6: Finally, click Save Details and Vote for This Enhancement. This enhancement has now been added to your “My ER’s within the “My Support” section of your Customer Portal. Congratulations! You have voted for an enhancement request! We’re one step closer to having this functionality added to the next version of SOLIDWORKS! Step 1: After some thorough searching we have not found a similar request. Select click here to create a new Enhancement Request. Step 2: Use the dropdown to select the Area of SOLIDWORKS this would affect. Step 3: Use the dropdown to select a Subarea. 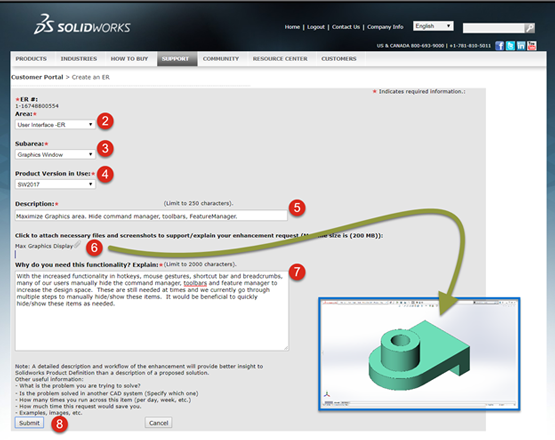 Step 4: For Product Version in Use, select the version of SOLIDWORKS you are working with. Step 5: Enter a brief Description. Step 6: Click the paperclip to attach a supporting file to your request. Step 7: Limit yourself to 2000 characters when explaining Why do you need this functionality. Review the note below for tips on how to phrase your request. Step 8: Once finished, click SUBMIT. This request has now been added to “My ER’s”. Please note, ERs are NOT the proper format for submitting bugs in the software or looking for help on immediate issues. Check out our FAQ on SRs and SPRs for more information. 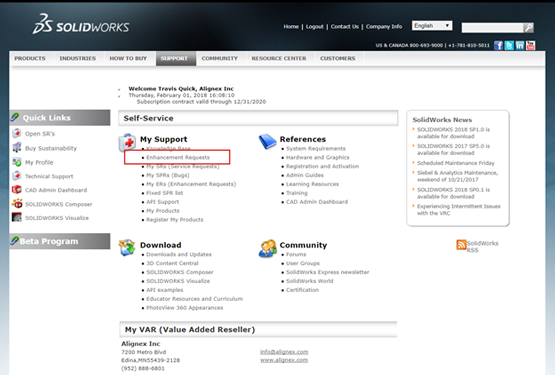 For immediate support, reach out to your Value Added Reseller (VAR) for SOLIDWORKS support. CONGRATULATIONS! You have successfully completed your enhancement request. Your next steps will be to tell all of your friends, enemies, and frenemies about this request and have them vote for it. Then go create another enhancement request!